Travel Oregon recognizes that our region’s legendary rain may be its most famous winter weather pattern, but it’s hardly our only one. Remarkably, sunnier (or snowier) skies are rarely more than a couple hours away. Travel Oregon’s new Oregon Weather Compass is the first-ever mobile site designed to point local and visiting explorers to the weather they want, along with a range of activities to make the most of it, using real-time weather data provided through a partnership with The Weather Channel. 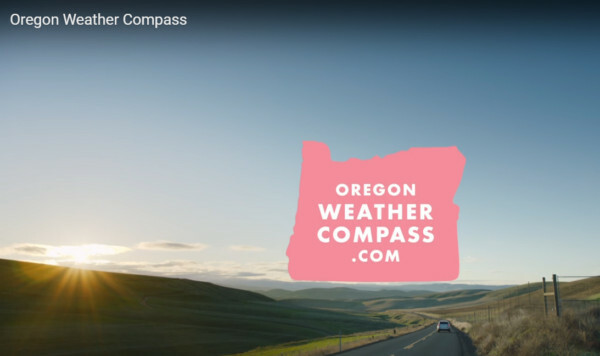 Developed by Wieden + Kennedy, the Oregon Weather Compass is a mobile site for explorers geographically located in the state or within 300 miles of its border. According to a recent study by Pew Research Center, the most “universal” task among smartphone users is accessing location-based information, with 90 percent of users seeking directions and other location-related details. With an eye toward this behavior, Travel Oregon set out to ease the trip-planning process, leading with weather-appropriate suggestions for various locales. When using the Oregon Weather Compass site, users simply hold their phones flat, like a compass, then select a snow, sun or rain icon. Users are taken to a location page featuring a potential destination within a reasonable drive (183 cities and towns around Oregon, along with associated attractions as featured on TravelOregon.com, are represented). The location page includes the destination’s description, expanded weather forecast, driving directions, and a link to more information and possible activities – from coastal storm watching in the rain to snowboarding down slopes of fresh powder to kayaking rushing waterways in the sunshine. The site conveniently links to navigation, and a share button is ideal for rounding up fellow adventurers to join the fun. The Oregon Weather Compass is a free site and only available as a mobile experience. For more information, visit http://traveloregon.com/trip-ideas/oregon-stories/oregon-weather-compass/. I like what you guys tend to be up too. This type of clever work and reporting! Keep up the good works guys I’ve incorporated you guys to blogroll. Hey would you mind letting me know which hosting company you’re utilizing? I’ve loaded your blog in 3 different web browsers and I must say this blog loads a lot quicker then most. Can you recommend a good web hosting provider at a reasonable price? Thank you, I appreciate it! I do not even know how I stopped up right here, however I thought this put up was once good. I do not know who you’re but definitely you are going to a well-known blogger if you aren’t already. Cheers! I think the admin of this web site is in fact working hard in favor of his website, because here every data is quality based material. Nice post. I used to be checking constantly this blog and I’m inspired! Very useful information specially the last part 🙂 I deal with such info a lot. I was seeking this certain information for a long time. Thanks and best of luck.